With delays for illnesses and vacations and all kinds of things we are finally able to call this round of miniswap complete. Katrina and Tristan were paired with Caroline who loves puppies, kittens, playing with dolls, etc. We decided for Katie and Tristan to each direct a project where they could help participate. Tristan’s project was a coloring set. 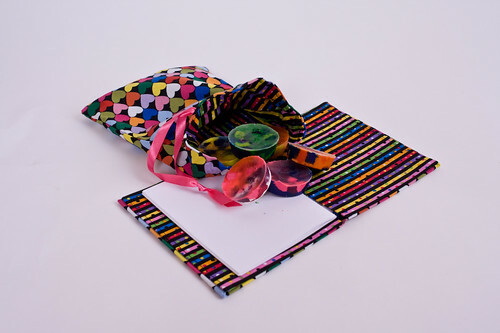 I made the bag and sketchbook and the urchins helped with the crayons. After looking through The Cute Book Katrina decided we should make a kitty for Caroline. We used the basic shapes included in the book but made some adjustments and made a mama cat too. 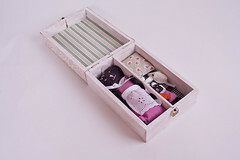 Then we decided to make some toys and other things a la Lyn and include them in an old wooden box that originally held olive oil and balsamic vinegar. So Mama Kitty and her baby have a fish and a mouse as well as a pillow and some milk bottles in case they get tired or thirsty. Mama’s apron comes off for when she’s not chasing Baby Kitty’s messes. 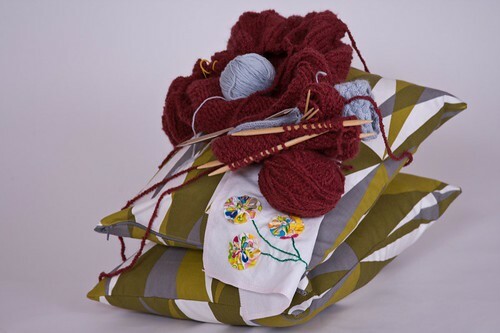 We also included a rice pillow that matches Katie’s — fabric choices made entirely by her — and some other purchased things that we thought Caroline might enjoy. Caroline and her mama, Amber, spoiled us and you can see what they sent here, here, and here . 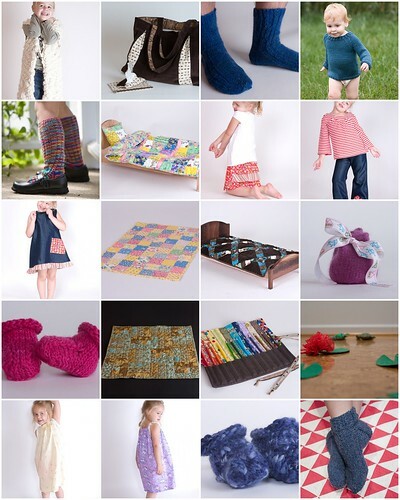 Thank you Caroline and Amber, and thanks Molly for another great round of miniswap. So these are the gifts Katrina and I gave our Valentines. 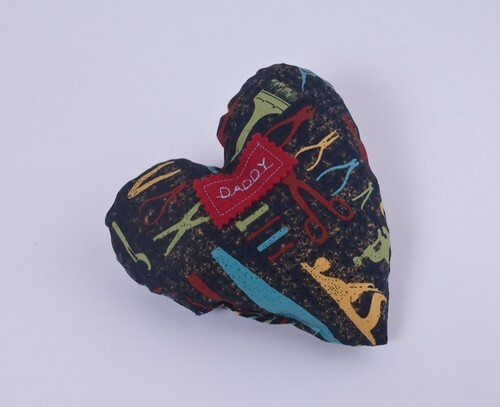 First, from Katrina, a pillow (about 6″ diameter) for her Daddy. We did the letters on my sewing machine — it has this one basic font — on a piece of red wool felt. 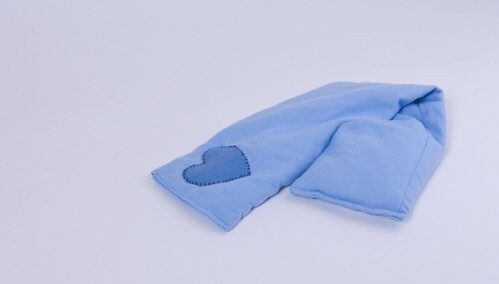 We then sewed that to a piece of tool fabric which we then made into a heart. She stuffed it and then we machine sewed it shut. I gave Papa a rice pillow, a la Blair. He’s been complaining about cold feet in bed so her post was perfectly timed. The outside cover is made of flannel so it’s soft as well as warm. And for my little valentine I made one of Hillary‘s robots from Put-Together Book No. 2. The best part of this guy was making his control panel. Definitely look through the flickr group before you make one for inspiration. 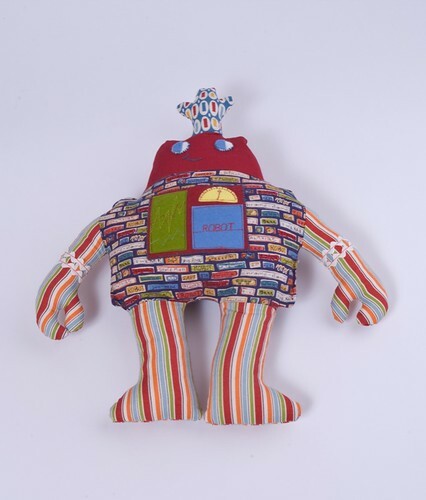 The fabric for the body is Robomatic by Jennifer Sampou — such a great little boy print — and the arms/legs and antenna are from Peas & Carrots by Sandy Klop. The only really completed thing is those pillows and they’ve been almost done for a long time. I just needed the zippers — an afterthought, I’m amazed they turned out — and I picked them up this week. 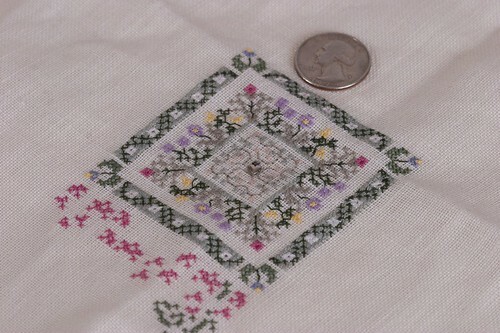 The yo-yo flowers are a label for my Virtual Quilting Bee quilt. The mitten is actually looking like a mitten now but still, there’s only one, and the big seamless hybrid has a long way until it lives up to it’s name. So, how was your week, did you get anything done? This gift is a birthday gift for my sister-in-law. When I gave my sister her pleated beauty bag last Autumn my sister-in-law dropped some serious hints that she might also like a similar gift. 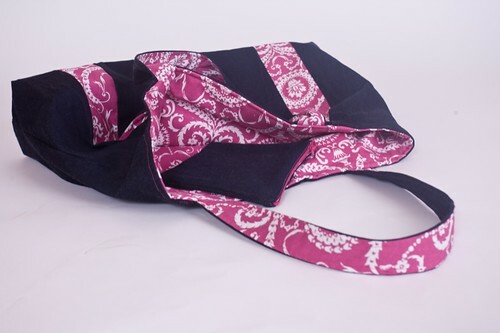 Her favorite color is pink so the choice of fabric was easy and the denim makes it a little more durable. Her style is a little bit preppy so I’m hopeful this will suit her. 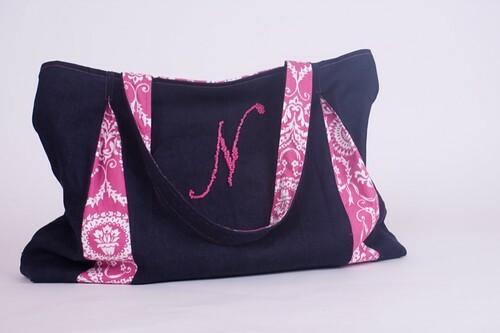 The N was hand embroidered — those are french knots people, a whole lot of them — and I am so happy with how it turned out. So, 2007 was a pretty good year on the crafting front. There are 84 photos in my Finished – 2007 set on flickr. Even I’m a little impressed by that. I’m particularly happy with how many new things I learned in 2007. Let’s review, shall we? 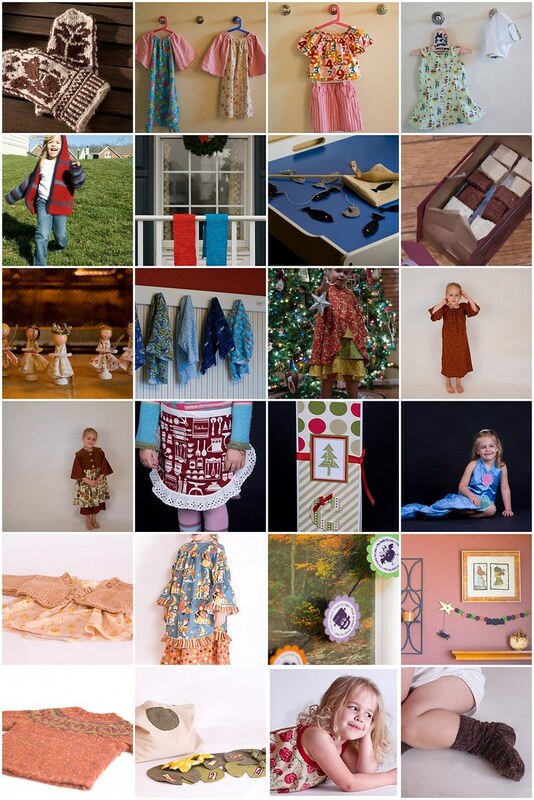 I think 2007 might just be remembered as the year I learned to sew. Wow, I’m so happy I finally conquered my fear. There have been a lot of pajamas and quite a few dresses. I even made my sister a bag. 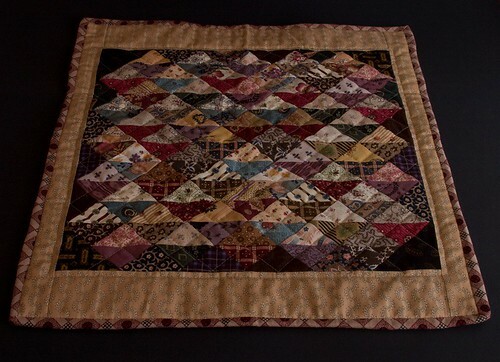 I also made my first quilt in 2007 and my second, third, fourth, and fifth as well. They were all doll quilts but I have full-sized quilt love for them all. There was plenty of food in 2007 although not too much of it made it onto the blog. I’m glad that some jam made into some of your homes though. Lots of paper stuff happened as well including garlands, folders, and altered bottles. And let’s not forget the altered tin for Father’s Day — one of my favorite projects from the whole year. We played games, we gave gifts, we swapped, we had two great birthday parties, and took about a million photos. So 2008 has some big shoes to fill. What do I have planned? Knitting wise I’d like to make more socks using a variety of techniques. I’d like to conquer a lace project and I am going to knit a sweater for Papa. At the sewing machine I want to continue to improve my garment-making skills and conquer my fear of knits. I also want to make a bed-sized quilt top — I’ll probably send it out to be quilted. I want to tell you more about some of the great food we’re eating and I really want to try to compost less of our CSA share each week. Thank you guys for being such a great inspiration to me, and not just when it comes to being crafty. 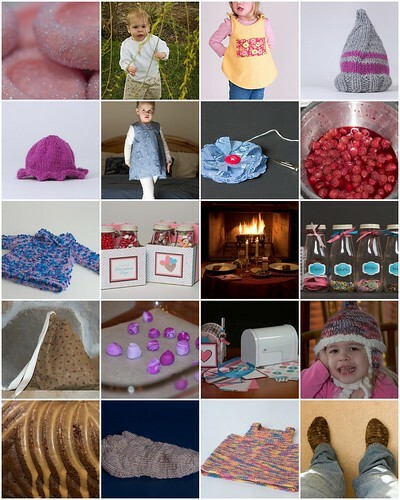 Your talent in knitting, sewing, mommy-ing — making in all regards — inspires me everyday. And that you take the time to tell me you enjoy what I make is really wonderful to me. Ready or not 2008, here we come. 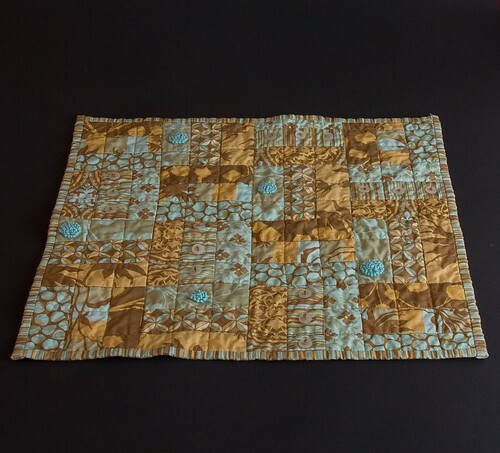 Are You Ready for Some More Quilts? I’ve got two to show today. 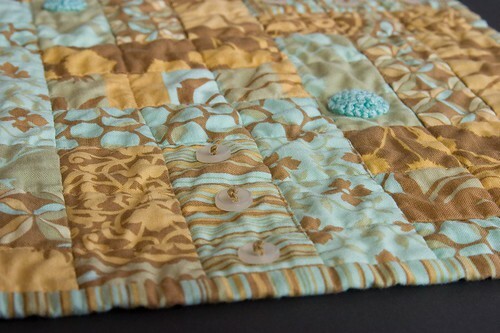 First up is the quilt I sent to Jhoanna as part of the Doll Quilt Swap II. She left it up to me as to what to send her. 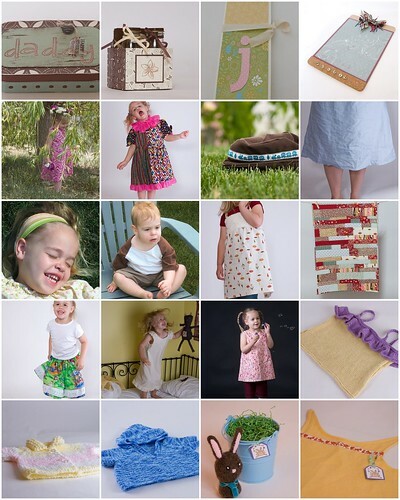 I found these fabrics designed by Joel Dewberry and then was inspired by a post on Amy Karol‘s blog. 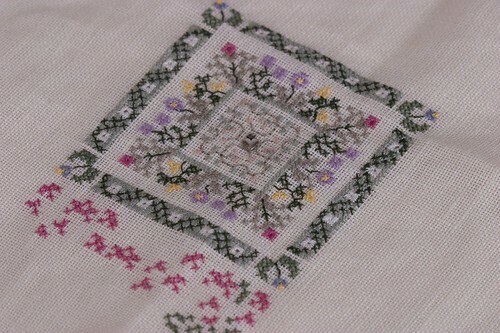 I loved making all those french knots. I think she was worried I wouldn’t like it but I love it. 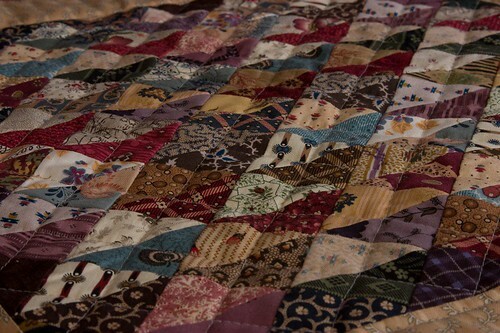 I am always amazed with triangles in quilts — they are really finicky to do — and all of Jenni’s are lined up beautifully. I love the civil war reproduction feel of it and I can’t get over the little touch of lavender in the fabrics. For some reason that just makes it for me. After finishing sweaters for both kids I was feeling like doing something besides knitting for a little while. 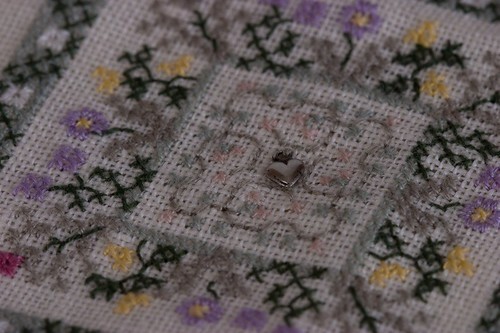 So I decided to take a look at some unfinished cross-stitch projects. I had given them up a while ago because I needed a better light and possibly a magnifier to finish them. About a year ago I got an OTT-LITE and I have reading glasses — not needed for reading but good for fine stitching — so I decided to pick one of the projects back up.